Folksy :: Buy "Gothic Lattice Pendant Necklace"
Chunky black and magenta lattice glass pendant on a necklace of black cord and organza ribbon. Lobster clasp with extension chain. 16 inch approx 40 cm long. 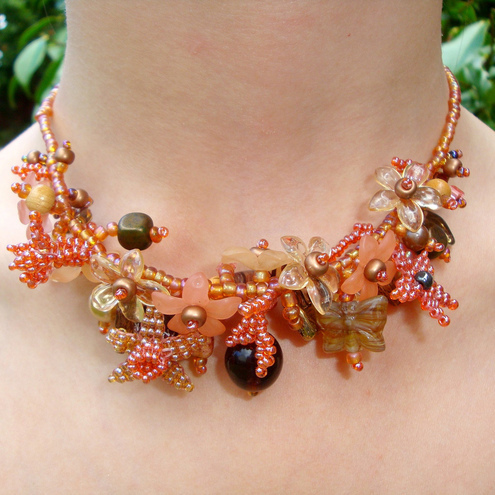 Pretty green and amber glass starfish pendant on a necklace of black cord and organza ribbon. Starfish 1 3/4 inches approx 4.5 cm across. Folksy :: Buy "Oriental Peach Blossom Necklace"
Made with glass, wood and acrylic leaf and flower beads with beadwoven flowers an leaves, on a string of glass seed beads. Tibetan Silver French hook style clasp. 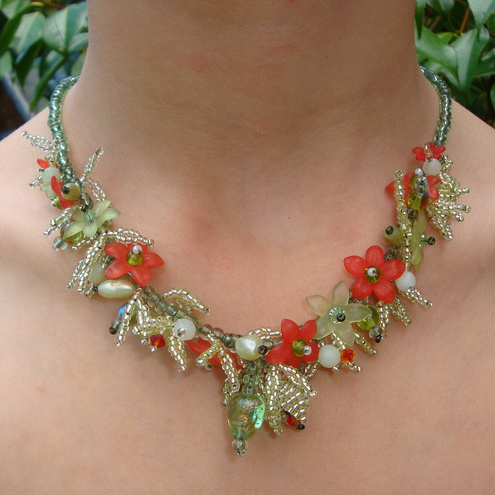 Folksy :: Buy "Summer Blossom Garland Necklace"
17" 45cm approx. Sits beautifully on neckline. Delicate red and green lucite flower beads, glass, jade, acrylic and swarovski crystal beads. All based on a string of translucent green beads. Handmade silver plated hook clasp. Folksy :: Buy "Chilli Pepper Earrings"
Gorgeous lampwork red chilli pepper beads approx 3cm long. Hand wire wrapped with silver plated jewellery wire. Pretty sterling silver ear wires. Folksy :: Buy "Chilli Pepper Bracelet"
Gorgeous lampwork chilli pepper beads with two colours pressed green glass leaves. Silver plated charm bracelet and toggle clasp. Folksy :: Buy "Lime Flower Drop Earrings "
Pretty delicate green flower drop earrings with green and white lucite flower beads, lime teardrop faceted acrylic beads and sparkling lime green Swarovski crystals. Folksy :: Buy "Strawberry Drop Earrings"
Glass lampwork strawberry beads with delicate green sparkly swarovski crystal beads. Pretty Strawberry bead matching bracelet available. Folksy :: Buy "Rose Flower Drop Earrings"
Rose flower drop earrings with glass beads, rose pink flower glass and lucite beads. These are such a delicate colour and dangle perfectly. Featuring sparkling pink and clear Swarovski crystals. Folksy :: Buy "Strawberry Charm Bracelet"
Strawberry silver plated charm bracelet. Each bead has been wire wrapped with silver plated jewellery wire. Beautiful lampwork strawberry beads with glass, lucite and acrylic beads. Folksy :: Buy "Pixie Flower Drop Earrings "
Pixie Flower Drop Earrings with lilac, purple, white and black glass, acrylic and lucite beads. These really pretty and delicate earrings are so light and hang beautifully. Folksy :: Buy "Red Gecko Beaded Earrings "
Hand made beaded with tiny matt red, sparkly gold and matt black glass seed beads on jewellery wire. 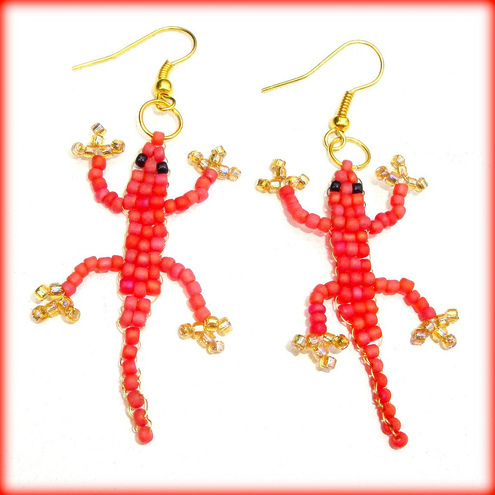 Wear a red beaded gecko in your ear! Folksy :: Buy "Dragon Flower Drop Earrings "
Dragon Flower Drop Earrings. Hand made with purple and green lucite flower beads and pretty glass flower beads. Matt AB purple and black seed beads perfectly complement. Blue Lagoon flower drop earrings with lagoon blue glass faceted beads, glass flower beads and blue and white flower lucite beads. These are very pretty and dangle beautifully. Folksy :: Buy "Elf Flower Drop Earrings "
Pretty Purple and Green Elf Flower Drop Earrings. Made with lilac, purple and green glass and lucite beads. 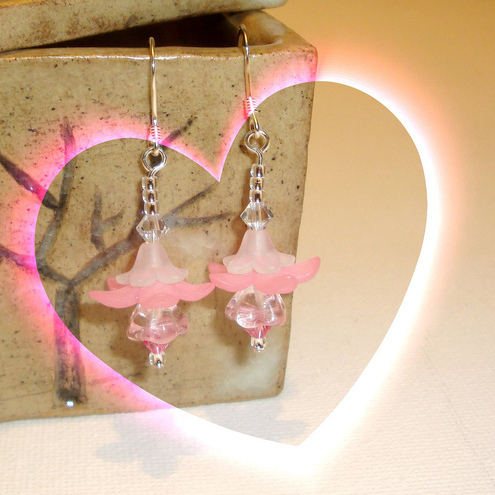 Delicate little fairy flower earrings can be made in a variety of colours.